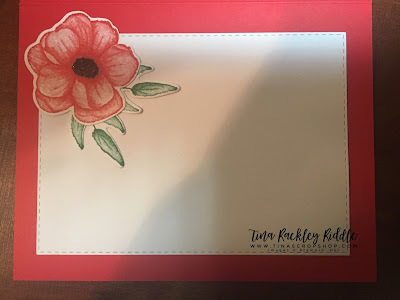 Tina's Crop Shop: SIP #192 - Sketch Challenge with SSS CZ Designs and Stampin' Up! 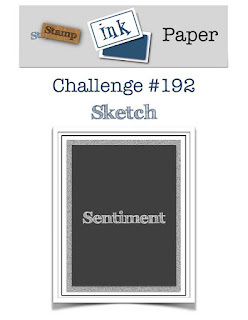 SIP #192 - Sketch Challenge with SSS CZ Designs and Stampin' Up! Hi There! Hope today is going to be an awesome day for you! It's Tuesday, so of course it's time for another SIP Challenge. This week we have a super easy and fun sketch.... check it out! How cool is that! I just love Cathy Zielske and I just picked up a cool "woot" die that she designed as well as an awesome sentiment stamp set so I had to use them. Simon Says Stamp carrys her CZ Design sets if interested.. make sure you head over and check them out! Of course, I turned the sketch on it's side. I always have to be a little difficult, right?? For today's card I really could have used any DSP but since I just received my Sale-A-Bration freebie for spending $100 at Stampin' Up "The Painted Seasons Bundle", I decided to go with it. I really love the colors in the DSP.. especially the Poppy Parade! The "Woot" Die from CZ Design is awesome and I love that it includes the shadow die so you can use two coordinating cardstock colors. The Stamp Set is SSS CZ Designs "Simple Sentiments II You are Loved" and it has awesome sentiments that I know I'll use soooo much! You'll notice I added a little stitched rectangle of Vellum to the middle of the card to soften the center and allow the sentiment to stand out! I decided to add one of the Painted Season Flowers and a couple of the leaves to the inside to coordinate it with the front! The flower was stamped in Poppy Parade and the Leaves were stamped in Call Me Clover Ink. The center of the flower was filled in with an Early Espresso Marker. Since the flowers in the DSP had Early Espresso centers that I coordinated this with those.